Samsung isn’t giving up on customer loyalty without a fight. 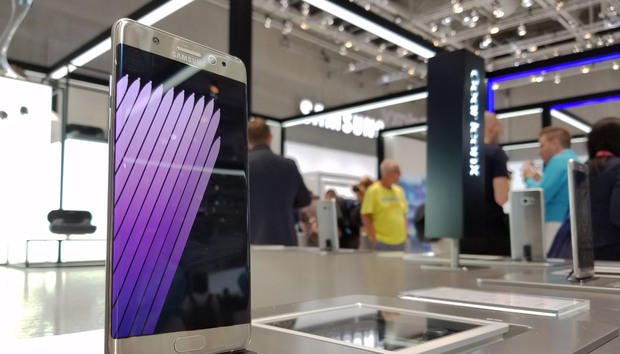 Samsung is aiming to win back those burned by the Note7 debacle with a new upgrade program that indicates the Note line isn’t dead after all. Targeted specifically at buyers in Korea, the company will give an S7 or S7 Edge to those who bought a Note along with an upgrade promise to a new Galaxy S8 or Note8 phone. That’s the first solid piece of evidence we’d heard that Samsung isn’t shuttering the Note line altogether. The company had previously hinted that the Note was dead given the spectacular demise. You can’t get worse product association than having your phone banned from U.S. flights or burning down a Jeep and garage. Given that Korea is the home hub for Samsung, it makes sense the company is starting there as a first test in trying to keep customers. Although the road ahead looks incredibly bumpy, with multiple class-action lawsuits headed to the docket both in Korea and the U.S.
Why this matters: Practically speaking this might mean a new Note may appear again some day, presumably without the tendency to catch on fire. Note owners tend to be loyal, and some of them might be willing to give it another try even after this debacle. However, it’s going to take some time for such a reboot, and many may have moved on to other alternatives like Google’s Pixel XL.